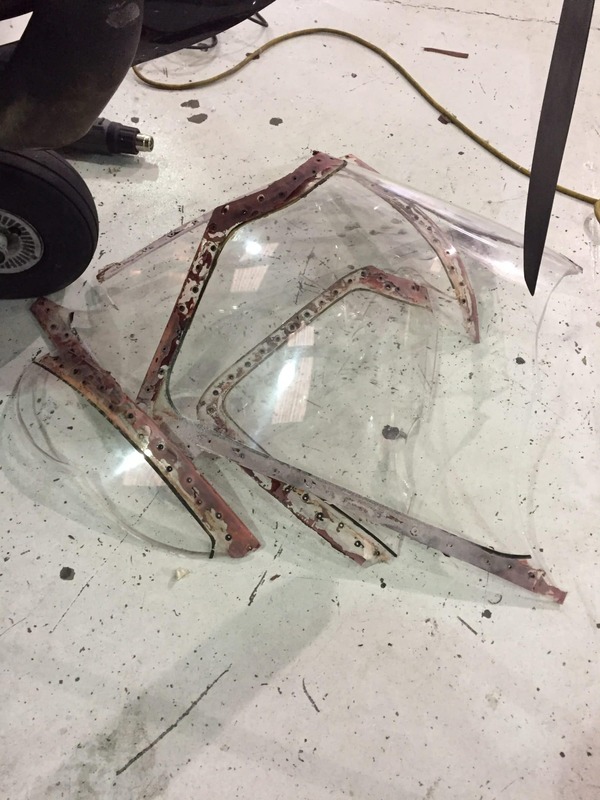 P210 Windshield Replacement | Tennessee Aircraft Services, Inc.
Technical items that get my attention as fodder for articles are usually those that I anticipate a fair number of readers may experience. Sometimes the subject matter is very uncommon but has some interesting component that appeals to the aviation geek inside me. In the case of a P210 windshield replacement, the last one I replaced was so long ago that I can barely recall any of the technical details. My interest in the subject was recently heightened as two separate customers, from opposite ends of the country, independently decided to have their windshields replaced at the same time in our shop. A very rare and unique opportunity indeed. Very few legacy airplanes have FAA required parts retirement items. The P210 happens to be one that does. At the very end of FAA Type Certificate Data Sheets for type certificate 3A21 revision 49, one will find Note 5 in the Data Pertinent to All Models which details the required parts retirement. For all P210 series, the windshield, rear cabin top windows, side windows, and the ice light lens must be retired at 13,000 flight hours. The normally aspirated 210 and the turbocharged T210 are excellent candidates for certain commercial applications, so it isn’t out of the ordinary to see them with ten thousand or more flight hours by now. In contrast, the P210 is primarily a personal business machine, and most are relatively low time. A quick check of the P210 inventory listed for sale shows a common average usage rate of 140 hours per year. At that rate, a 1978 P210 won’t see a mandatory windshield change until the year 2070. At a possible high usage rate, or 200 hours per year, a 1978 P210 won’t see a mandatory windshield replaced until 2043. Certainly, the required windshield retirement is not a concern for most owners. 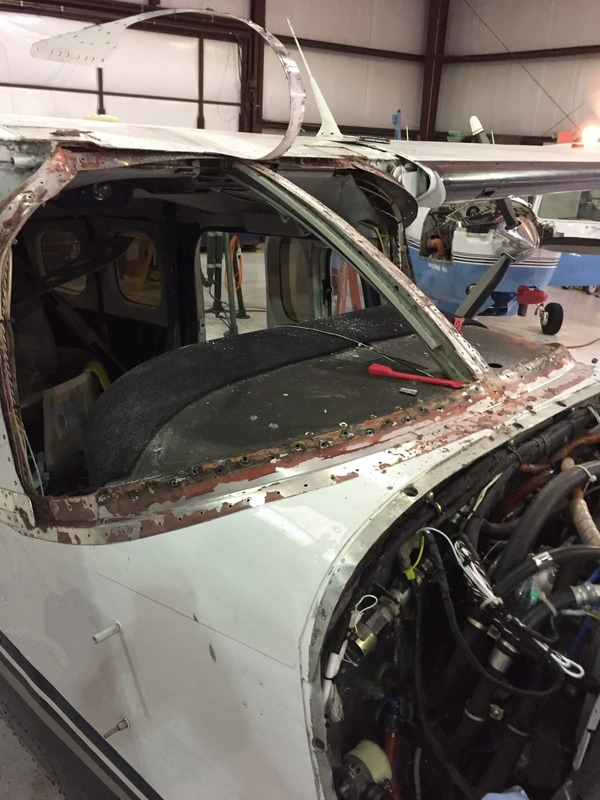 I performed a search of the FAA and NTSB accident data and have been unable to find anything to support that a windshield has ever failed a P210 in-flight. It would appear that at this point in the service life of these planes, the windshield is not a safety of flight issue. Of course, that doesn’t mean they should be ignored. In fact, a close inspection of the windshield is a major effort in every pre-purchase evaluation. Not that it’s a probable safety issue, but it may soon become a financial issue should the windshield be found deficient in some way at the next annual inspection. The service manual describes maximum damage allowances in the critical viewing area. They even go so far as to include an illustration of that critical viewing area. The funny thing is that the illustration shades the entire windshield as critical. I struggle to understand the purpose of the illustration but will continue to ponder the possibilities. The maximum nick or dent damage allowance within the critical vision area (the entire windshield) without performing any repair would be no more than 0.025” diameter and 0.016” deep. Only two of these are allowed within any two square foot area of the windshield. Nicks and dents are not repairable. Scratches can be repaired up to 0.020” wide and 0.008” depth with no more than twelve inches per area. The P210 Service Manual describes the procedure for removing scratches which starts with 320 grit sandpaper. This scares me right off the bat as 320 grit paper will mostly increase the number of scratches that need to be removed. It’s more time consuming but far less damaging to start with 600 grit and limit the work to the very immediate area of the scratches. Once the original scratch is eclipsed by the sanding marks, the process is repeated with progressively finer grits of sandpaper until about 2000 grit. Polishing is the final step, which may include progressively finer polishes as needed to get the clarity desired. If nicks, dents or scratches exceed the stated limits, the only option is windshield replacement. 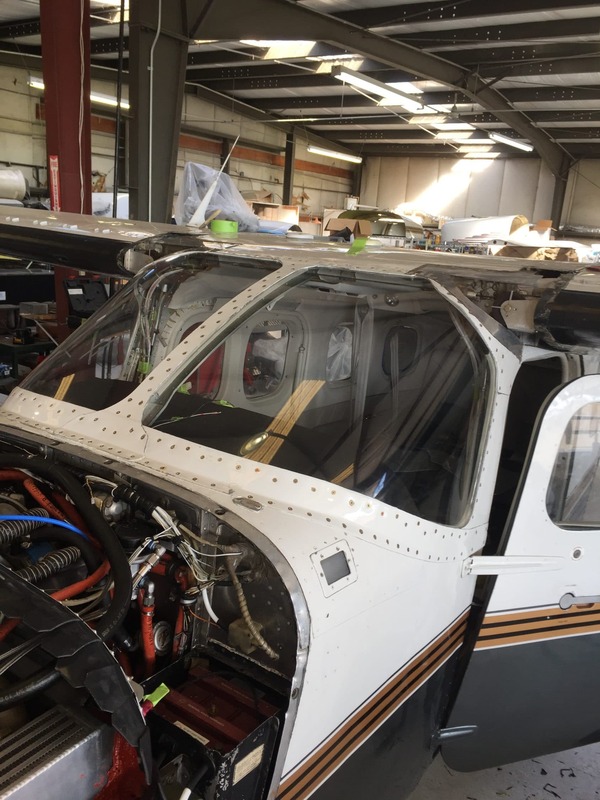 Should you find yourself in the unenviable position of needing to replace this windshield, be prepared for a large labor effort and very little in the way of instructional guidance from the Cessna P210 Service Manual. My guess is that Cessna imagined windshield replacement in the P210 would be such a rare event that it just wouldn’t be worth the effort to create detailed instructions. Another more plausible thought is that Cessna had lots of practice installing these but very little experience in removing them, so they didn’t have much real world advice to offer. Regardless, it isn’t rocket science, but it does require intentional forethought and planning. Cessna produced a very elementary labor allowance book many years ago for warranty usage. It didn’t include much, but it did cover windshield replacement for most single engine models. The P210 labor allowance for windshield replacement is listed as sixty man hours. Having performed two of these jobs in a row, I can affirm that sixty hours is not even close to the needed time. After our first replacement, we audited the process and found several causes for the labor time overages and a few ways to improve the time. The first realization is that the published time couldn’t possibly have allowed for removing a significant part of the instrument panel component and then reinstalling them: flight instruments, avionics, engine gauges, pneumatic plumbing, defrost hose, defrost port, and wire bundle relocation. Depending on the plane’s configuration, this step alone might consume two days. Pulling up the floor panels to recover all those retaining nuts and washers that dropped into the abyss under the rudder pedals and landing gear motor accounted for at least another day. On the plus side, simple familiarity with the job could reduce labor time by at least twenty percent. Not having to spend so many hours creating the details for the replacement process omitted from the P210 service manual instructions should help. 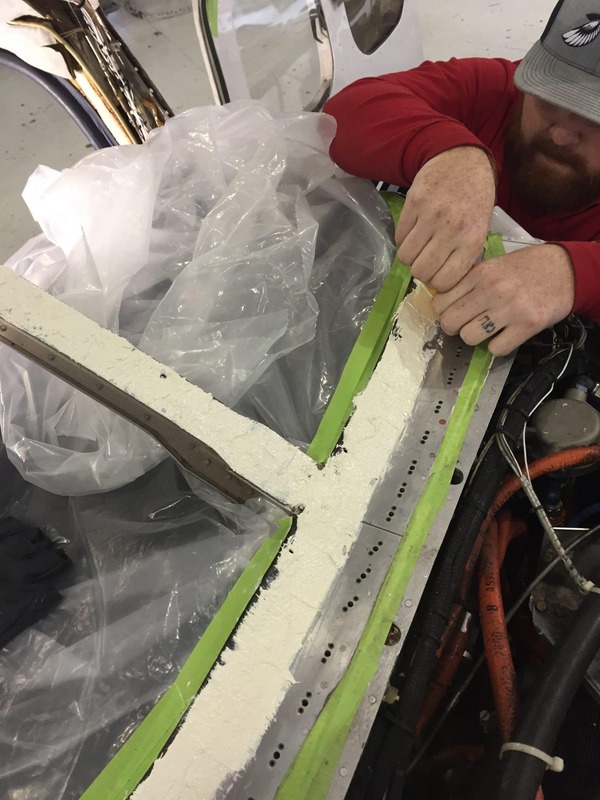 Upon removing the windshield from the first plane, we found what appeared to be standard high viscosity fuel tank sealant around the top and side edges of the windshield. All the other mating surfaces were sealed with a low adhesion sealant as one might find on the removable access panels of a fuel tank. With slow gentle persuasion, the old windshield extracted nicely. The windshield from the second plane was a very different story. There was still the high viscosity sealant around the top and side edges, but the other mating surfaces were a thin, high adhesion sealant. Slow and gentle efforts to remove this one were useless. We employed progressively more intense leverage methods until the windshield finally surrendered, in pieces. Whoever installed this windshield had no compassion for the mechanics that would someday need to remove it. The manual calls out the approved sealants for windshield installation. Two sealant types are called for: a Type I and a Type II. The Type I is basically the very heavy bodied version of a fuel tank sealant and is very easy to come by. It’s only used at the top and side edges of the windshield as a position support. The Type II sealant options turned out to be more challenging to source. It is also the one used over the majority of the mating surfaces and is responsible for most of the pressurization sealing. Most fuel tank sealants use Methyl Ethyl Ketone (MEK) as a thinner which also just happens to attack windshield material and will cause crazing. They also have a relatively short cure time, which is a real problem during this windshield installation. With so many screws and nuts to install, a long working time is critical. As it turns out, we attended a class on sealants presented by PPG during Airventure this year. We contacted the presenters in hopes of finding a vendor and found out that PPG is the only producer of the Type II sealant as well as the only vendor. It was in stock, but we did have to wait several weeks for it to be packaged. This Type II sealant is like nothing we’ve ever seen or used before. First, it’s white when most sealants are some version of grey or pink. It’s very thick with a grainy consistency that doesn’t spread easily. This sealant also has no hardener or activator and is non-hardening. Non-hardening in the sense that after application it doesn’t cure at all; it just stays the same sticky white goo as it was when it came out of the applicator. It was very difficult to work with at first, and we didn’t care for it at all. Once we worked with it a bit, the reasoning made perfect sense. 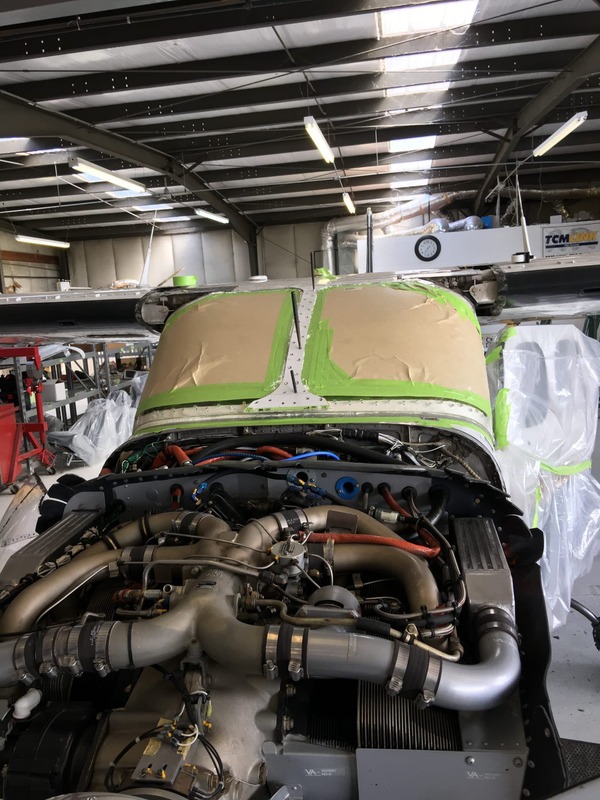 We had all the time we needed to install the windshield and could work in a much more relaxed manner to achieve a good quality job. The service manual instruction gave no guidance about the many holes that had to be drilled in the new windshield, including no information about the diameter or the chamfering found on each hole. A call to Textron gave us hole specifications from the original factory installation drawings but no procedure. The specification requires each hole to be a significantly larger diameter than the screws to make room for a rubber type spacer. The presumption is that the spacer would prevent the windshield from making direct contact with a screw should the windshield move around a bit. Unfortunately, the first windshield we removed was not installed with any spacers. A research of the maintenance records showed no evidence that the windshield had ever been replaced, so we presumed it came from the factory in this state. The second windshield did have spacers, but they were of a totally different material than the new ones we ordered from Textron. With Textron not being able to provide us with written information and the conflicting evidence from the two apparently factory installed windshields, the path forward was very much our own. Obviously, this is not a “how to” for P210 windshield installation. It’s mostly a cautionary tale for those who find themselves needing, or wanting, to take on such a project. As we’ve discussed, there are only a couple of mandatory triggers that would compel such an effort. The labor cost alone should be a natural deterrent for most owners. The clear as mud installation guidance from the thirty-two plus year old service manuals should suffice to give pause. All unnecessary maintenance should be avoided for many reasons. To that end, this article is a warning to P210 owners, pilots and caregivers to be very protective of these very important pieces of plastic. I have a 1978 P210 and looking to replace the two front windshields. I see that you have experience with this and wondering you are able to acquire a new or after market winshield as I am unable to locate one. There are no aftermarket windshield suppliers for the P210 windshield. Textron is the only source that I know of. Sorry to be so late responding. I hope this is helpful.